Gotcha! Happy Belated April Fool’s! C’mon. Admit it! I bet the title of this article drew you in. I recently had a woman tell me that she was really disappointed in what I was teaching. She thought it was the same old tired stuff. She was hoping for a revolutionary new way to lose weight. First of all, I don’t market myself as anything new and revolutionary. I’m much more interested in what actually works, not the latest gimmick. I’ve been around the weight loss game a long time and the last big revolutionary new thing that happened in weight loss was bariatric surgery and unfortunately, I’ve had many of those people as clients. They found it didn’t work for them because nothing had changed in their minds; they were still fat inside, and eventually they gained most of the weight back, some even more than when they started. Yes, it’s really possible to do that even with a smaller stomach. You just get smarter at how you get all those calories in. I also think this is why bariatric surgery is associated with increased suicide attempts after the surgery. These suicide attempts occur after the initial “honeymoon phase” of weight loss is over. This is just my personal theory, but I think it’s because before the surgery, people tell themselves this is the miracle they’ve been searching for their whole lives, and when that turns out not to be the case, in fact, they’re still the same fat person inside, they wind up killing themselves. By the way, I’m not against bariatric surgery, it can be a lifesaver for some morbidly obese people, but I believe people need to get coaching throughout the entire process and especially afterwards, so they really make the necessary internal changes, in order for the surgery to be truly successful and long lasting. 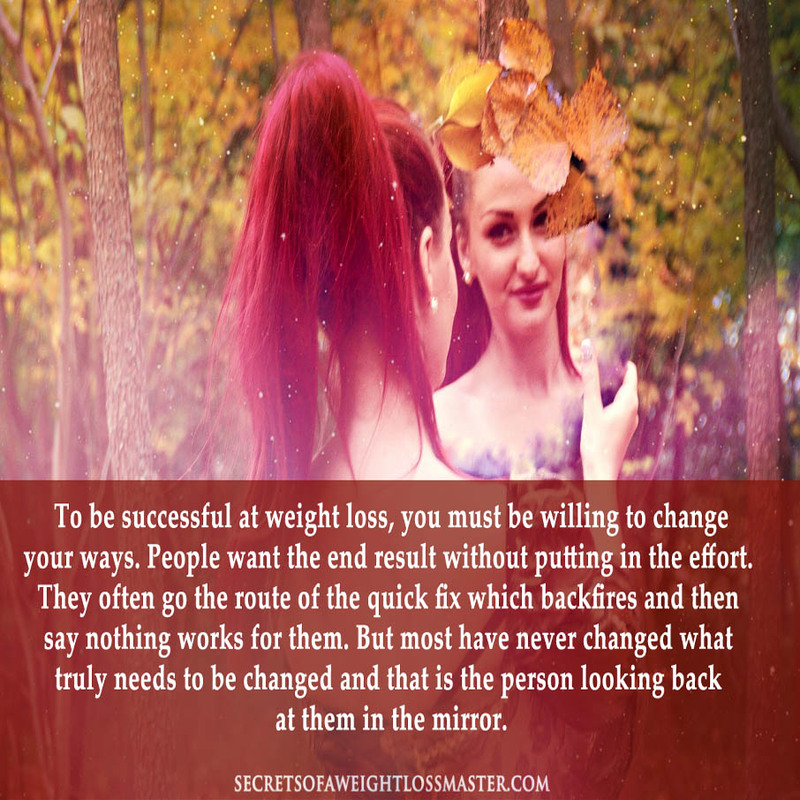 We’d all love a revolutionary new way to lose weight, but the truth is sooner or later you have to face yourself and change what’s not working from within. This includes your limited beliefs, your distorted thinking, your assumptions, your habits, and your attitudes about yourself, food, and how you approach life. This means getting serious about doing the real work and not expecting a complete transformation in a few weeks or even a after a month. Yes, it’s human nature to want a softer, easier way, and because of that, to become a shiny object chaser – wanting to try the latest diet gimmick or cleanse – but after years of yo-yo dieting that doesn’t work and getting fatter in the process, hopefully you come to a place where your yo just doesn’t want to go any longer. Many people come to me when they’re in this place. They’re in deep despair because they just can’t bring themselves to diet anymore. They’ve hit a bottom with dieting and they think this means they’re never going to lose weight and I tell them that actually they’re in a very good place. This is when they’re finally ready to let go of dieting and become receptive to learning a new way. For anything new to happen, you have to be open and willing. And often, you have to have exhausted your other options. You also have to let go of the old and create a space for the new to appear. Transformation isn’t all bliss. It’s really a little death; a letting go, or a shedding of an old skin. Change involves loss. 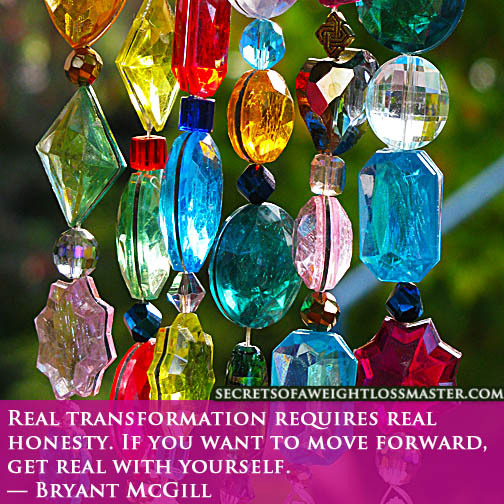 Transformation is a bit disorienting because as we move forward into the new, we are temporarily on shaky ground. This can be anxiety provoking. Many people would rather stay safe and cozy in their comfort zone than face their fears and shortcomings, and move forward. True change is challenging and that’s the truth. But if you want to grow, you have to get honest with yourself and embrace challenges. So, if you want something truly revolutionary, I suggest getting real with yourself and looking within. It’s usually the last place anyone looks for answers, especially when it comes to food and weight. You have all that you need inside of you to create a revolutionary change. What’s really holding me back from losing weight and/or overcoming overeating? I’d love to read your comments on the blog. If you’re not going to take action, I suggest you make peace with the situation, as nothing’s going to change. If you’re ready to take action and create some changes, contact me, I’d love to be your coach on your journey to a new you.